Whether you want romantic sunset shots with the beautiful backdrop of Hawaii or playful images along the water's edge, we know how to deliver the images you want. Every photo shoot is a personalized experience for each couple. All of our photographers have meticulous attention to detail, a thoughtful approach and expert knowledge of Hawaiian settings to make all weddings of Hawaii memorable. The following is a list of our packages or scroll down for a comparison of all the packages. Our Aloha Package the end of the session with all images taken. 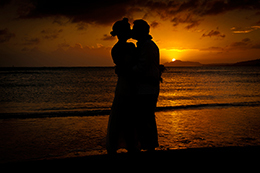 One hour session perfect for small beach weddings. You have full rights of the images and all images posted online for friends and family. We go to secret beach spots around the island for some pre-wedding photos the day before. Swimming, diving, hiking, waterfall, and the rainforest. You also receive 30 images “digital botox” where we remove small blemishes, spots, shadows, dark circles, crow’s feet, or other undesirable characteristics – giving you a more youthful, perfected appearance without making it look artificial. We can Live stream your Wedding also. This for Adventurous people only we meet in Kauai Hike to a beautiful waterfall. We provide the Minister and the flowers. Our photography package session is 5 hours. In addition you all unedited image files at end of the session, all images posted online for friends and family and personal* copyright for a reprint of all images is included. You also receive 30 images “digital botox” where we remove small blemishes, spots, shadows, dark circles, crow’s feet, or other undesirable characteristics – giving you a more youthful, perfected appearance without making it look artificial. We can Live stream your Wedding also.